Have you ever noticed people spending couple minutes staring at their organizer? They’re trying to collect the thoughts, ideas, details of the projects, and appointments or they have downloaded a number of applications to get updated and follow all the notifications. It is not a surprise that we try to do our best trying to keep pace with the times. Everything changes so quickly in the world today and as soon as we want to be successful and achieve all those dreams, plans we have in mind. It’s time we all admit that we need help in organizing our lives. It’s going to be a chore to do all this, but staying organized makes life easier in the long run. Just think about how easy it’ll be to find stuff you need and avoid last minute hassles. We have tried to collect the best tips on how to move with the times. You will only further complicate your life by trying to contain important dates and reminders in your head. Write down everything: shopping lists for groceries, holiday gifts, home decor, and important dates like meetings and birthdays. If you want to remember things, put it in writing, or in a digital notebook like Evernote. Keeping your to-do, lists and other information written somewhere allows you to look back at it anytime. A day planner is another great way to keep your time organized. It will break down the week by day, allowing you to put in appointments or meetings for each day. It is especially useful if you have a lot of commitments throughout the day. Write down all of your commitments by an hour in the day planner. Check the planner at the start of your day so you know what you have scheduled and can stay organized. For example, you may write down a meeting in the morning, a phone call with a client in the afternoon, and a deadline in the evening. 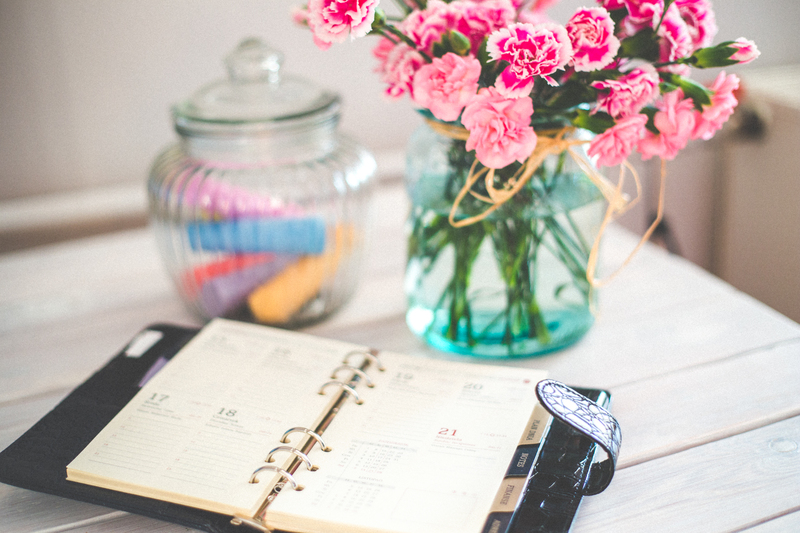 Put all important dates in the calendar, such as due dates, appointments, and meetings. Keep it updated regularly to help you organize your time. Make it habit to check the calendar daily, such as first thing in the morning or before you go to bed at night. Color code items in your calendar by priority. For example, you may highlight important dates in red and less important dates in yellow. If you are using a calendar app on your phone, you can set reminders a few days or a few hours in advance so you don’t forget an important date. You can also use other organizing apps on your phone like 24me, Quip, and Wanderlust. Make easy-to-access storage spaces for things you use all the time, and don’t let your storage spaces get cluttered. Be creative about finding places for things. Doing this will take time, but after a while you’ll see how easy it is to find what you need when everything in your place has a home. Back up your computer files and have duplicates made for your car and home keys. Scan your IDs, passports and bank details, too then put it all in a secured folder in your computer. Keep the original and photocopies of your financial records, birth certificates, land titles and insurance in one folder, preferably tucked away in a safe. Also to create a back-up of your photos is a good idea. In such way, you won’t be afraid to loose precious memories. More stuff means more clutter. People who live organized lives only keep what they need and what they really want. Having fewer things also means that you enjoy those things more and feel better about using everything you own, rather than letting half of what you own collect dust. Another way you can work in a more organized way is to multitask, where you switch between several tasks at once. Multitasking can allow you to get multiple things done within a short period of time. It can also help you be more organized, as you will feel less overwhelmed or stressed about the things you need to get done if you complete them all at once. But!!! Just keep in mind that some studies have shown that multitasking may diminish one’s ability to focus on one thing at a time. 12. Reward yourself for staying organized. To help motivate you to stay organized, use a rewards system. After completing tasks from your to-do list, you can encourage yourself by doing something that brings you pleasure. Read about How to Set Your Business Goal? Wiki How, Keep in Spiring, LifeHack, Forbes.